Alpine Elastomer Products, LLC is the partner you need when developing your next manufacturing project. Our plastic molding company in Boonton, NJ, provides comprehensive product manufacturing and custom injection molding services that help you to avoid the pitfalls that can come with importing your goods from other countries. Using our extensive network of engineers and designers, we create the different items you need efficiently and effectively. When you choose us, you are able to avoid the hassles of dealing with international brokers while also avoiding problems, such as lower quality on second runs, which can sink the success of your products. Your complete success is very important to us and we are going to put all of our resources to work for you to ensure we exceed all of your expectations. When you are trying to get your manufacturing project off the ground there are a lot of different aspects you need to keep in mind. Some of the most important aspects are your budget, the quality, and your timetable. These are three things that our plastic molding company excels at helping you meet. By choosing us, you are able to rest easy knowing that your tool molding is of the highest quality. Whether it is the prototype or your third or fourth manufacturing run, we make sure that you are getting nothing less than the best from us. Additionally, since we handle all of the manufacturing for you, you can avoid unnecessary shipping costs and the potential delays that can come from importing by yourself. Because we are manufacturers, we know how a well-run facility should operate. This knowledge and experience has led us to develop personal relationships with many different factories across the country. We have even, personally, inspected many of them. This is how we make sure everything meets ISO standards for you, our clients. We also make sure the workers at our partner factories are treated fairly. This is important because a happy employee is one that does his or her job well. Overworked or underappreciated employees could lead to a dip in quality, which hurts everyone. It also means you can work with us with a clean conscious knowing that everyone that has come together to bring your project to life has been properly treated. Hello, my name is David McCrink and I am the President of Alpine Elastomer Products, LLC. I would like to take a moment to tell you something about our company and what it does. 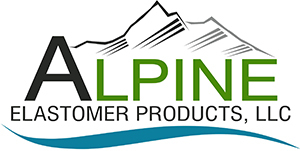 Alpine manufacturers and imports high-quality, custom-made rubber and plastic products for our clients. We offer our customers the benefit of our many years of experience, manufacturing in the United States and importing from the Far East. We provide fast design service and prompt delivery to all of our clients while combining it with our low, Far East pricing. Our factory and showroom are located in Boonton, New Jersey, United States of America. We invite you and your team to come and visit us so you can see, firsthand, our many molding presses and die cutting machines. This also gives you the opportunity to view hundreds of samples in our impressive showroom. Many people ask us “what does ‘Elastomer’ mean?” I tell them that it refers to the material that is rubber-like, that stretches, and is flexible. I can promise you that Alpine Elastomer is always “flexible” to meet your needs. Furthermore, since we have such a large sourcing base in Asia, there is almost no limit to the materials and products we can offer to you. Reach out to us to begin discussing the different options available. Whether you are an engineer, designer, inventor, or a buyer, I invite you to contact Alpine Elastomer Products LLC to see what we can do for you. Contact us for more information about our plastic molding company. We look forward to providing our manufacturing and custom injection molding services to clients located throughout the Boonton, New Jersey, area.